Back in the day, no one except Marines wore ink. Tattoos were frowned upon for educators, professionals, and folks that showed skin. This is no longer the case. Millennials and Baby Boomers are showing their colors. Having tattoos is more the norm than the exception. Centuries ago, tatts were also used to single out deeds, choices, tribes, or messages. Hunters and fishermen love antlers, birds, and fish tattoos. Tatts come in color, black and white, or the ones that blend into you skin. Some tatts really are detailed and almost 3 dimensional. There are many reasons why people get inked. For some it is show of love for a person, sport, or lifestyle. 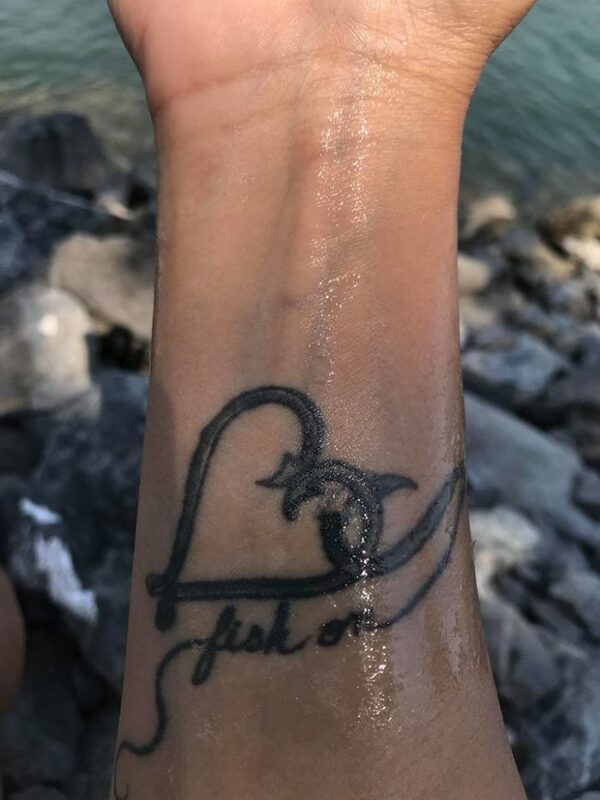 One fishing friend got inked using fishing hooks for celebrating her love of fishing and her beau. Two birds with one stone. Tattoos tell a story. Some people have tatts that reflect experiences, dedications, or just fun. No one in my family had any Tatts except my Uncle Jim and Zeke. They were in the Navy and Marines. My Dad flew 50 combat missions in WW2 but was Tatt free. Today, I am the only Tatt free person in my family. Even Montana Lin has a tatt of two little birds leaving the nest. The birds came back a few times but finally made it on their own. My son is doing the sleeve thing with tatts reflecting his life. Many others have an ankle this, or a little that. No matter what you do, it is your body. We all want to be unique and special. You better like what you ink. If you are not sure, there are tatts that are semi-permanent. If you don’t like them, they can be removed easily. This might be a good idea for guys with changing wives and girlfriends. Also, be aware of infection and sanity issues. Common sense is also important. Your tattoos will send a message and reflect on you. Big Tatts on your face, or exposed areas will be seen and judged. Some will like your choice and others won’t. If you wear an ugly shirt, you can take it off and throw it away. For more Montana Grant, you can find him, Tatt free at www.montanagrantfishing.com.